Heading into a Tuesday night home game against the surprisingly struggling Tampa Bay Lightning, the Calgary Flames had won six straight and were sitting comfortably in a playoff spot. A lacklustre effort had Tampa skating circles around the Flames for 55 minutes and left Calgary battered, 6-3. Another loss to Columbus – 4-1 for the visiting Blue Jackets, their 8th win in a row – leaves Calgary with only a one-point cushion on the final playoff spot. Despite the two unimpressive efforts from the Flames, they were both, frankly, unsurprising losses to very strong Eastern Conference teams, and still gives the team a 5-2-0 record in December. While the Lightning have struggled of late, and have been unable to cope with a bevy of injuries (Steven Stamkos, Ryan Callahan, Nikita Kucherov), this is still a team that will be there in the end and is one of the elite teams in this league. Tampa brings astounding forward depth and can roll four lines on any night, with a Norris-calibre defenseman in Victor Hedman, and a top-flight goaltender in Ben Bishop. Nobody in the East wants to see Tampa in the playoffs, and the Flames shouldn’t be discouraged or shocked to have seen the Lightning show up with the effort they did. As for the Blue Jackets, well, they are a much more surprising team than Tampa. While not much was expected of them heading into the season, some solid depth combined with the emergence of young talents like Alex Wennberg and Zach Werenski has led Columbus to one of the best records in the league, emerging as a serious threat in the Eastern Conference. So, with all of this in mind, losing back-to-back games to two very strong, deep, and fast teams is no reason to panic as it’s not altogether surprising. While dropping two games in a row shouldn’t have fans losing their cool, there were some lessons to be learned in those losses. 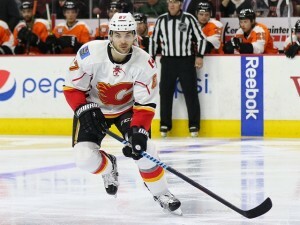 In both games this week, the Flames faced teams that have a wealth of forwards who can chip in offensively. Calgary, on the other hand, has shown an inability to find scoring depth this year, which is becoming a cause for concern. Through 33 games, only Sean Monahan (10g, 33gp) and Johnny Gaudreau (7g, 23gp) are on pace to eclipse the 20 goal mark for the Flames this season. It’s nice to see these two back on track after slow starts and an injury to Gaudreau, but this team can’t expect to stay competitive in the playoff race if others don’t begin to chip in at a higher clip. As of Monday, the Flames sit 20th in the NHL in goals per game, after finishing 11th in scoring last year. Sure, the goaltending is vastly improved, but Calgary is also only 22nd in goals against per game. It’s a pretty safe assumption that a team in the bottom third of the league in both goals for and against is likely to find themselves in the bottom third of the standings at the end of the day. The goaltending situation is what it is, for better or worse, but the organization needs to be able to lean on the likes of Mikael Backlund, Michael Frolik, and Kris Versteeg to pick up their scoring, and support the two big guns up front. With Saturday’s re-assignment of Tyler Wotherspoon to Stockton (then recalled again today), the question needs to be asked whether or not he is capable of playing reliable minutes at the NHL level. At 23 years old, Wotherspoon has managed to play only 26 games with the big club since being drafted in the second round of the 2011 entry draft. To put that in context, there are 21 defensemen out of that draft alone who have played more games than Wotherspoon, ranging from Adam Larsson, Jonas Brodin, and the Flames’ own Dougie Hamilton down to Scott Harrington, Xavier Ouellette and Adam Clendening. Wotherspoon was never expected to have the same ceiling as some of those top picks, but while the Flames have had some strong top 4 units over the past couple of years, it’s not like Wotherspoon has seen an unusually high level of competition for a 5/6 spot on this team. He’s been routinely looked over in favour of the likes of Raphael Diaz, Corey Potter, Jakub Nakladal, and even Corey Potter in the last couple of years. With his contract expiring this summer, you have to wonder what the Flames’ plans are for the pending RFA. 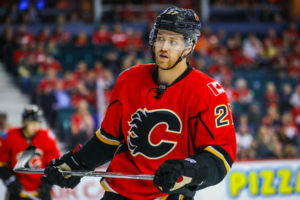 On a positive note, Wotherspoon will be available on a cap-friendly deal and if he can step into an everyday role in the next year or two, the Flames could see some serious value in a new contract. While losing two straight games in unimpressive fashion left a sting, Calgary has a real opportunity to redeem themselves and set the right tone heading into the short Christmas break, with three divisional games coming up this week. The schedule sees the Flames play back-to-back games, visiting Arizona and San Jose, followed by a couple of days off before hosting the Canucks. Needless to say, Arizona and Vancouver are very winnable games, and although going to San Jose for the second half of a back-to-back will be difficult, it will provide the team with an opportunity to keep the Sharks close to the pack in the Pacific Division. Ultimately, taking four or five points this week would allow the team to hang onto a playoff position heading into Christmas – something that many didn’t expect at the start of the year – and that should leave the team feeling happy over the holidays.